Think about mucus – what comes to mind? It’s slimy, it’s gross, no one really likes it, right? Well, as a team from San Diego State University showed, mucus is also home to a very powerful immune system that has the possibility to change the way doctors treat a number of diseases. Bacteriophages are basically viruses that infects and replicates within bacteria. The research addressed all sorts of animals, from sea anemones to mice and humans, and found that bacteriophages adhere to the mucus of all of them. 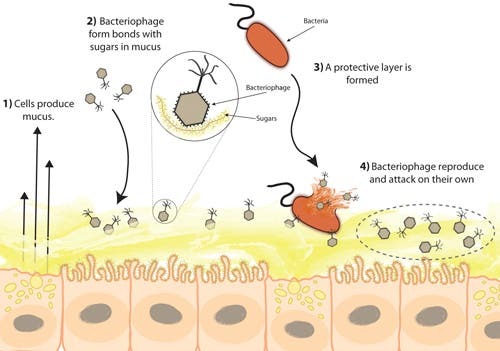 They placed bacteriophage on top of a layer of mucus-producing tissue and observed that the bacteriophage formed bonds with sugars within the mucus, adhering to its surface every single time. They then challenged themby injecting E. Coli in the mucus, and they found that the bacteriophage attacked and killed off the E. coli in the mucus, effectively forming an anti-microbial barrier protecting the host from infection and disease. In order to test their discovery, they then conducted a parallel research on non-mucus producing cells, infecting them with E. Coli, in the same fashion. The results were disastruous for the cells. “Taking previous research into consideration, we are able to propose the Bacteriophage Adherence to Mucus — or BAM — is a new model of immunity, which emphasizes the important role bacteriophage play in protecting the body from invading pathogens,” Barr said. But what makes this finding really special is that that the bacteriophage are already present on all humans and animals; they are recruited almost as mercenaries by cells who support them and then act as protectors to the host, attacking invaders on their own.